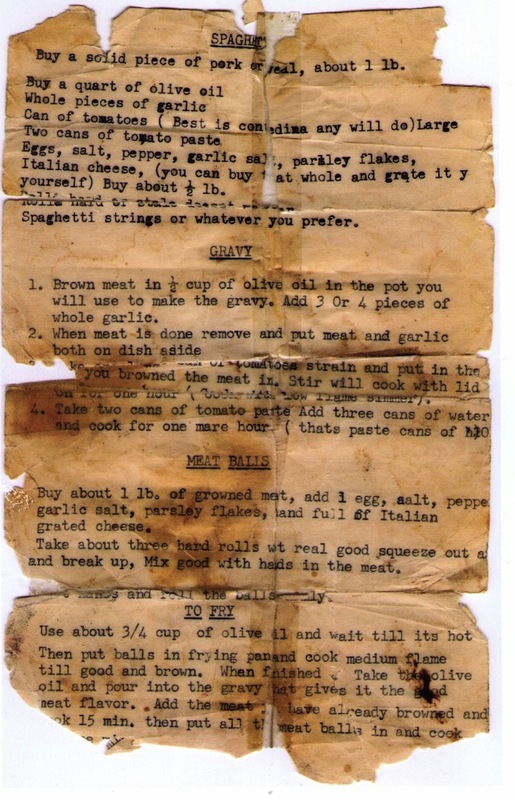 It all started with an old, old recipe. This is my favorite recipe for authentic Italian gravy (a.k.a. tomato sauce.) It was passed down to me by my mom and dad, who received it from my aunt’s Italian mother-in-law (who heard it from her father’s uncle – just kidding – but it really did come from my aunt’s mother-in-law.) I grew to love this sauce as a child. I savored the spaghetti and meatballs my dad made with the recipe, along with the little bits of pork that were in the sauce that gave it a sweet, rich flavor. So how did sauce become soup? To be honest, I’m not really sure. I think my immersion blender may be partially to blame, along with some other liberties I took with the recipe. Let me explain. When my heirloom tomatoes were harvested a few weeks ago, I decided most of them would go into this tomato sauce recipe. Only this time, I decided to do things a little differently. I didn’t have pork or chops, so I decided to make it meatless. Since I wasn’t frying up meat, I cut the original recipe’s olive oil in half. I also decided to use a tomato sauce seasoning that I have mixed up in my cupboard for a different sauce recipe I occasionally use. Things were simmering right along, taking shape into a wonderful sauce when I decided to use my immersion blender (my favorite kitchen appliance second only to my rice cooker) to smooth out the sauce to perfection. Lo and behold, a delicious tomato soup was born. I think the blender emulsified the olive oil into the tomatoes to give it a smooth, velvety soup texture. This soup instantly reminded me of the tomato soup they serve at Panera Bread. I’d even go so far as to say it could pass as a copycat recipe. Try it yourself and see if you agree! First, the sauce seasoning mix. This makes quite a bit, and it can be stored in your cupboard or pantry for up to a year. Like I mentioned, I use this in several other recipes as well, so you will probably be seeing it again soon. It’s a great replacement in any recipe that calls for a packet of spaghetti sauce seasoning. Store in an airtight container for up to a year. Fill a large stock pot about half way with water and bring to a boil. Place about 2-3 tomatoes in the boiling water at a time, and allow the whole tomatoes to boil for just a minute or two, until the skins start to pucker. Remove tomatoes and place them on a cutting board to cool slightly. Repeat this with all your tomatoes. Once they are cool enough to be handled, slide the skins off the tomatoes and trim away any stems. Chop the tomatoes into sections and scoop out as many of the seeds as you can. Empty your stock pot of any remaining water and heat your olive oil in the pot with the 3 tbs. seasoning mix. Once the seasoning is incorporated and starts smelling lovely, it’s time to add your tomato chunks. Cover and simmer for one hour. 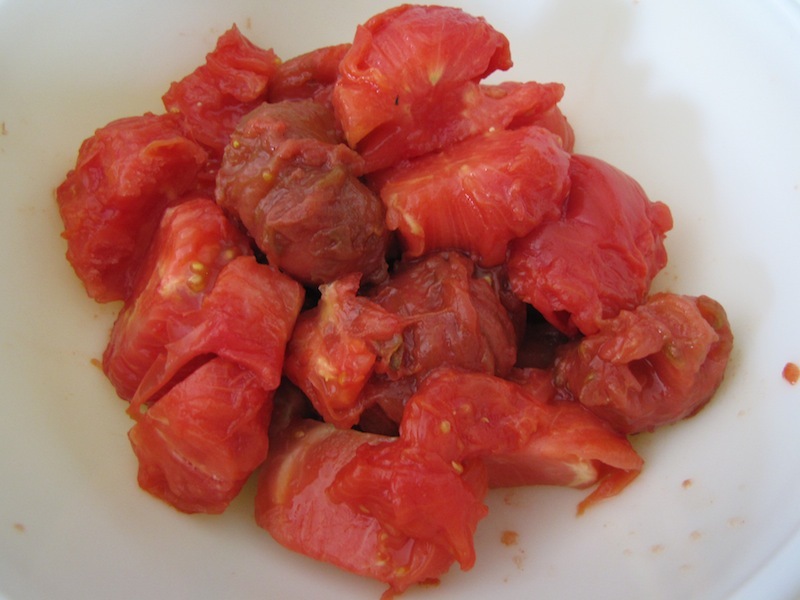 Once your tomatoes have simmered for an hour, add one can of tomato paste and one can of water. This is where I whipped out the immersion blender and created the smooth soup. If you don’t have an immersion blender, now would be the time to transfer your soup into a blender to puree until smooth. I’m sure this would actually make a good sauce, too. Just adjust how much you blend accordingly for a chunky or smooth sauce. You could go super chunky and not blend it at all. I hope you enjoy this sauce/soup! I love tomato soupd. Thanks for sharing. I’ve always loved a good tomato soup with a grilled cheese sandwich. Now if I can just find someone to make it for me. 🙂 Maybe I’ll call in one of my favors from my wife and see if she’ll hook me up. I’m sure it will cost me though. The soup looks beautiful and I LOVE the old recipe – really interesting and scrummy post! 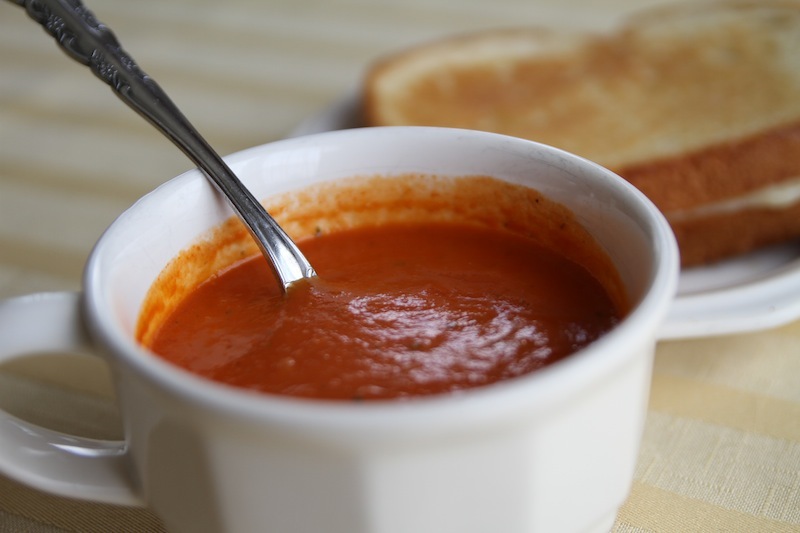 I have loads of tomatoes from my father’s garden – I am trying this asap….we love tomato soup and my husband is crazy about the panera version. I can’t wait to taste this! This sounds delish! I love pork in my sauce… Thanks for the recipe! “Accidental,” improvise-as-you-go, variation on the theme recipes are the best! I was wondering. Could you recopy the original recipe to make it readable? I think I’d like to try to make that! If it’s lasted this long, it must be something else! Hi Charlotte, if you click on the image of the recipe, it can be enlarged quite a bit…Hopefully that helps!